The soap opera-like Galati saga is quintessential South Philadelphia. Galati, described as a friend and associate of mobsters Joseph Ligambi, George Borgesi and Joseph "Skinny Joey" Merlino, often talked and acted like a mobster and frequently quoted lines from Goodfellas, one of his favorite mob movie. Friends and associates have insisted that Galati was all talk, that he enjoyed the mobster motif even though he was never a part of the reality. The feds offered a different spin. Authorities have long suspected that Galati's body shop was used to outfit a stolen van used in an infamous mob shooting targeting then boss John Stanfa on the Schuylkill Express. Portholes had been cut in the sides of the van to allow shooters to spray Stanfa's car with bullets as both vehicles traveled at high speed along the eight-lane highway during morning rush hour traffic. Stanfa's son, Joseph, riding in the back seat, was wounded in the attempted hit which occurred during the height of a 1993 mob war between Stanfa and Merlino factions. No one has ever been convicted in that shooting. Galati's reputation as a standup guy was enhanced after he was convicted in the late 1990s of insurance fraud and served nearly three years in prison, rejecting attempts by authorities to cooperate against organized crime figures and tell what he knew about the van. 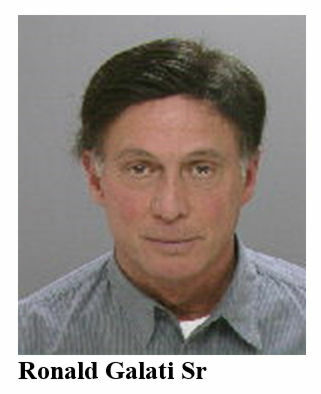 Galati returned to South Philadelphia after his prison sentence and again went into the auto body shop business. His first murder-for-hire conviction revolved around allegations that he had offered to pay two hitmen to kill the boyfriend of his then estranged daughter Tiffany. The boyfriend, Andrew Tuono, was shot outside his Atlantic City home in November 2013. Tiffany Galati was at Tuono's side as the hit went down, but she was not injured. She subsequently testified for the prosecution at her father's federal trial. Tuono, who survived the shooting, also was a government witness along with the two hitmen and a third Galati associate who admitted helping Galati recruit the shooters. The Common Pleas Court case centered on a massive insurance fraud scam run out of Galati's South Philadelphia auto body shop. That case, brought by the Philadelphia District Attorney's Office, also included allegations that Galati had recruited the same two hitmen to killed a rival body shop owner and his son who Galati believed were cooperating in the insurance fraud investigation. That hit never went down, but the two gunmen were prepared to testify that Galati had offered them cash to kill Joseph Rao and his son. Galati has steadfastly denied that allegation. This fall he entered no contest pleas to the insurance fraud and murder-for-hire charges in the Common Pleas Court case. Ironically, his daughter was in court that day supporting her father. She and Tuono ended their relationship shortly he was shot. She has since reconciled with her family, according to friends and associates. Galati's son, Ron Jr., was sentenced to house arrest and probation in the same insurance fraud case. The appellate court ruling this week appeared to end any hope Galati Sr. had of reducing his prison time. A three-judge appellate court panel rejected a somewhat technical argument in which Galati claimed that his conviction for aiding and abetting the use of a firearm in the commission of a violent crime was unwarranted. Galati appeared to be arguing that a phone call he made to set the murder-for-hire plot in motion did not legally constitute aiding and abetting. "Galati's effort to cast his involvement in a scheme that ended with a man being shot as lacking the use of physical force is creative," the appellate court wrote. But the panel found it insufficient to warrant overturning his conviction.